How to make our favorite homemade bruschetta with tomatoes and basil. Plus, five easy tips for how to make it best. Jump to the Fresh Tomato Bruschetta Recipe or watch the quick video below to see how we make it. We like things to be simple — wholesome ingredients, fresh flavors, and few ingredients. So when we find something we love, we make it often. Did you know most people have five to ten recipes they rotate throughout the year? 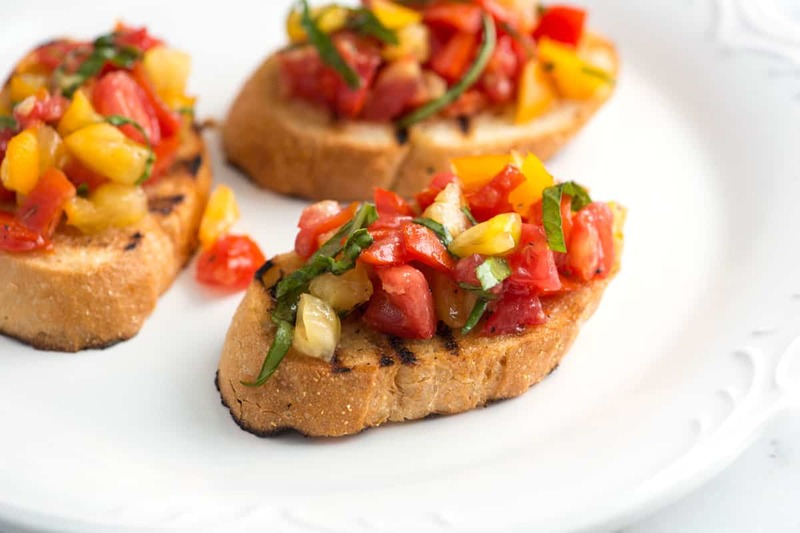 We’re no different, which is why we make this simple bruschetta recipe with tomato and fresh basil all the time — especially during the summer. Sure bruschetta is simple, but did you know you can probably make it better? Here are five easy tips for making it best. If you can, grill the bread. You don’t need to do this outside, although it’s a great option. Since we make this so often, we’ll reach for our indoor grill pan. 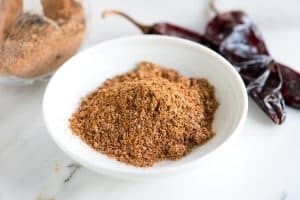 It works beautifully and creates just enough smoke to add a little flavor to the bread itself. Grilling the bread is less about the grill marks and more about the smoky flavor you achieve. If you can not grill the bread, toast it. 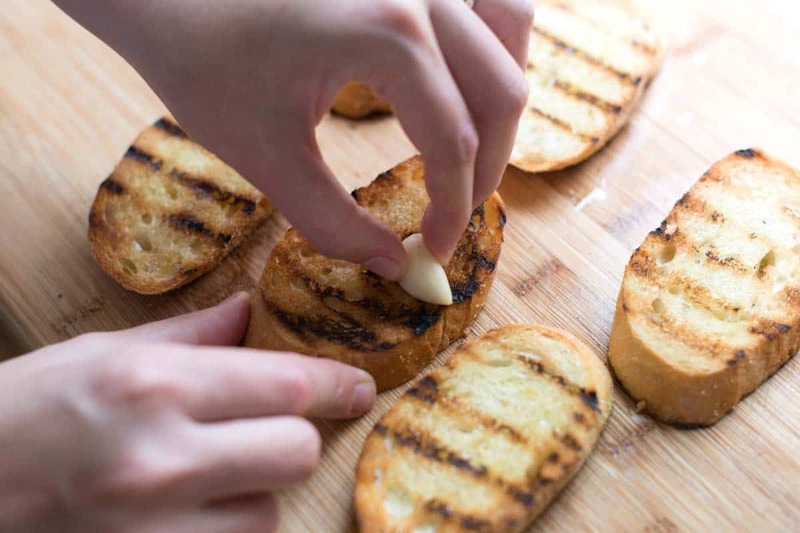 The moment the bread comes off the grill, give it a quick rub with a peeled garlic clove. The garlic practically melts into the warm bread. Not only is this the more authentic way to make bruschetta, but it also tastes much better than if you were to mince garlic and add it to the tomatoes. The amount you rub onto the bread is up to you — we keep it pretty light. Use the best tomatoes you can find. During the summer, we are inundated with sweet, plump tomatoes. In other months though, you might need to look a little harder. When we’re in the mood for tomato bruschetta outside of summer, we do have one go-to — Look for Kumato tomatoes, we’ve found them to be pretty sweet and consistent all year round. They are darker, almost brown and usually come in a plastic-wrapped package. You might also get lucky with smaller, vine-ripened tomatoes. Use room temperature tomatoes. It’s essential that you don’t refrigerate the tomatoes you plan to use for bruschetta (or most things). Something happens after refrigerating tomatoes — they become less flavorful and less tomato-y. We leave them out on the counter. They taste so much better this way. Season the tomatoes. Before doing anything else, we chop the tomatoes and season with salt and pepper. Not only that, but we leave them alone for about 10 minutes. As the tomatoes sit, they become extra flavorful. They also release some of their juices — this is perfect for when we’re topping the bread later. We do this for our easy tomato salad, too. By the way, 10 minutes is the ideal amount of time for grilling bread. Score for multi-tasking. After that, add olive oil to the tomatoes and if you have it on hand, some fresh basil. (Parsley or even chives would work, as well). 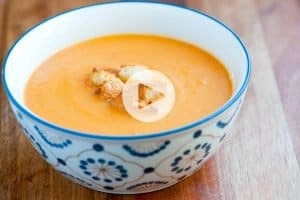 Spoon the tomatoes onto each bread slice and make sure you spoon a little leftover tomato juice that seeped out while you were seasoning the tomatoes– that stuff is gold. Enjoy! Fresh and easy creamy cucumber salad made with Greek yogurt, vinegar, fresh lemon, garlic, and dill. Use fresh or canned tomatoes to make our homemade marinara sauce. Store it up to a week in the refrigerator and up to 6 months in the freezer. With tomatoes, basil, parmesan, and lots of garlic, this simple orzo pasta has become one of our favorite easy recipes! 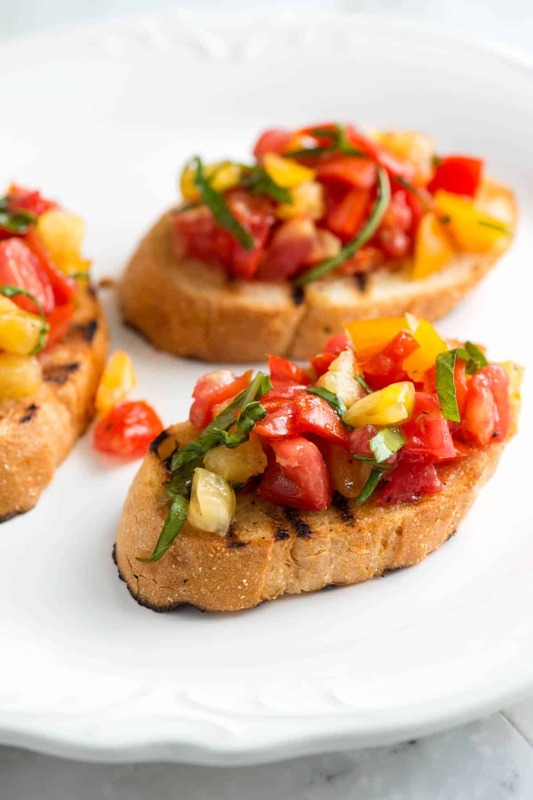 This simple bruschetta recipe with tomato and fresh basil is best when you use fresh, room temperature tomatoes. It’s also important to set aside a little time to allow the tomatoes to sit with salt. As the tomatoes sit, they become extra flavorful. They also release some of their juices, which is perfect for spooning onto the bread later. Halve tomatoes then remove and discard the majority of the seeds. 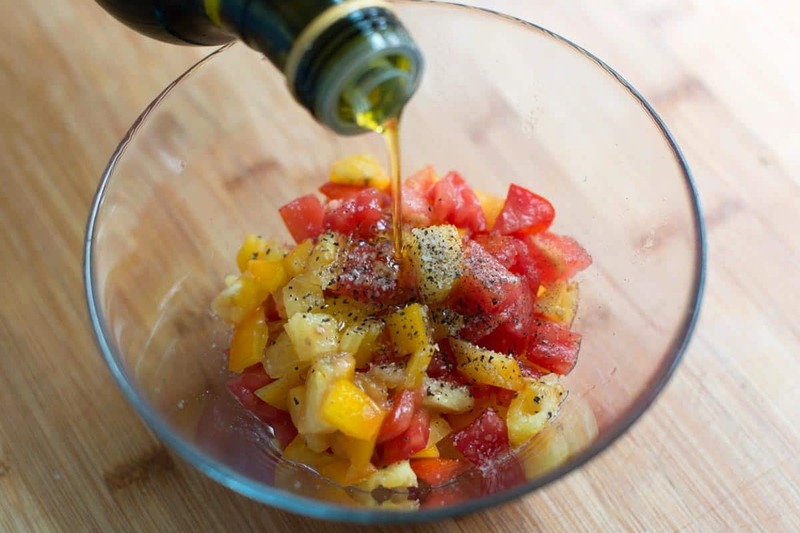 Chop tomatoes into 1/4-inch chunks then add to a medium bowl with a generous pinch of salt, a small pinch of black pepper, one tablespoon of the olive oil and the basil. Stir and let sit 10 minutes. Meanwhile, heat a grill pan over medium heat or prepare an outdoor grill for medium heat. Drizzle bread slices with the remaining tablespoon of oil and grill 2 to 3 minutes on each side until warmed through and grill marks appear. Rub one side of the bread while still warm with garlic — two to three strokes per bread slice should do it. Stir the tomatoes one more time; taste then adjust with more salt or pepper as needed. Spoon a generous amount onto each bread slice. Drizzle a little of the juice remaining at the bottom of the bowl over tomatoes and enjoy. Canned Tomatoes: If you do not have access to sweet, ripe tomatoes, use high quality canned whole tomatoes. Reserve the juice for another recipe and chop up the whole tomatoes for the bruschetta. We love San Marzano tomatoes and have also been very happy with canned Muir Glen tomatoes. I always keep basil flavored olive oil at reach of hand for when I don’t have the fresh herb. 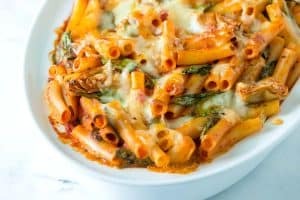 Fits perfectly in this recipe! We added red onions and broiled both sides of the bread in the oven. Loved it!! I like the way this tasted but I was raised on hot bruschetta. We always made crostini in the oven. Then topped with the mix and baked or broiled till hot. It marries the flavors wonderfully. I look forward to getting a grill pan to try that way. I followed the directions to a T, grilling the French bread slices on top of our gas stove over low-medium heat, watching closely. The demonstrated recipe did not give precise oven heat for the grilling phase. A quick camera shot looked as if the temp was set at 300-degrees. I have been taught to preheat the oven. The finished product, almost clearly presented, depends on the flavor of the tomatoes. Ask your produce person when the best season is for which tomato. Taste test one tom before making the recipe. Having followed the tomato choice advice, the end result was excellent. Fortunately, most markets in the So Cal area carry either fresh bunches of basil or living basil plants. I disagree that one could skip the basil. Flavorful tomatoes, superb fresh bread, great fresh-off-the-vine basil, Tunesian olive oil and American garlic are critical components for success. Excellent instructions, except for the omission of the oven temp. I made this today. I put the bread under the broiler on low. Later I made it by grilling the bread. Either way worked great. Rubbing the garlic was perfect! The tomatoes were delicious and I made them just the way you described. I also added some fresh cold sliced mozzarella for protein. Hi: tried your recipe and its great, but along with the Basil a little oregano and a small jalapino pepper makes it recipe par excel-lance! All our friends at the yacht club raved about it. Hi. Congratulations for an authentic receipe. This is the taste I was looking for. 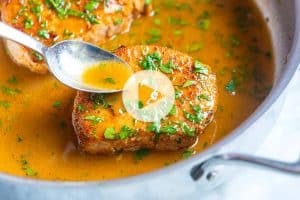 I did try this receipe today and after eating almost a full bread I just can’t get it out of my head. It will be with me for the whole summer. Thank you. Thank you for being so generous and sharing your cooking ideas and especially for sending the videos and your instructions. I enjoy learning about how to make food more interesting in a visual sense. But because of my present daily demands the most I can do is make a quick watch and hope I pick up some improvements along the way in my daily cooking. In other words, I watch it and like it, but don’t always have time to make it. Plus I’m a strong habitual pressure cooker lady. I love fast, healthy, and economical cooking best. You both seem so nice and I sure hope you are finding huge rewards in the business of cooking!!!! Sincere Best Regards for your Career Always! Hi Carol, thank you so much for your note! We love that you enjoy our videos 🙂 Thanks again for you kind words! I completely agree about grilling the bread ! I do mine on a gas grill and find the best results come with turning all the burners on medium, placing the oiled bread on half the grill for 30 seconds or so and then flipping over, turning off the burners on the side the bread is on, closing the lid and leaving for a few minutes. Thank you for the grilling tip, this adds a visual and palate yumminess. I noticed Resturants r using a spread of cream cheese on top of toasted bread the tomatoes. I think it is taste good! Can this be made the day before? How far ahead and how do you store it? Hi Laurie, As bruschetta sits, the tomatoes become softer and softer. You can make it in advance, but it is really best eaten the same day. For the best bruschetta, we would stick to no more than 4 hours in advance. Hope that helps! What is the yellow in the bruschetta ? Yellow bell pepper ? Corn ? Hi there — We used both yellow and red tomatoes. All red or all yellow are great. (Although, some diced bell pepper added would be lovely). Came out great! I didn’t grill it enough but I will next time. One of my favourites. Sometimes simple is better. Love the colours in yours! Love this!! Such a good, classic, appetizer.